After a heated argument about equal rights, during which the girls insist they want to be treated exactly as if they were men, the Ricardos and Mertzes go off to an Italian restaurant (on 39th Street near Eight Avenue) for dinner. When Xavier, the waiter, on Ricky's insistence, presents four separate checks, the girls discover they have no money. They are ordered by the management to wash dishes (so many that Lucy suggests, "I think he takes in dirty dishes from other restaurants"), and the girls decide to get back at the boys by phoning them from the bistro, informing them that they are being robbed and mugged. Ricky subsequently calls the police, then rushes down to the restaurant himself only to find Lucy and Ethel unharmed. To counter the subterfuge, Ricky and Fred disguise themselves as crooks, burst into the kitchen, and surprise the girls. Just then, the cops arrive and arrest Ricky and Fred. At the police station, Lucy and Ethel are uncertain about bailing them out. "Mean-looking, aren't they? Lucy snarls, before relenting. Special Notes: When Lucy and Ethel go to the police station to "claim" Ricky and Fred, the girls identify them by their kiss. Notice that Ethel's lips come nowhere near Fred's, dispite the kissing sound. 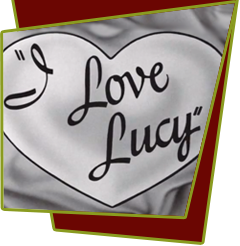 This episode is based on lucy's radio show, My Favorite Husband, Episode #78, "Women's Rights (part 1)".